Elaeis guineensis subsp. nigrescens A.Chev., Vég. Ut. Afr. Trop. Franç. 7: 46 (1910), not validly publ. Elaeis nigrescens (A.Chev.) Prain, Index Kew., Suppl. 4: 77 (1913), not validly publ. Palma oleosa Mill., Gard. Dict. ed. 8: n.º 6 (1768). Elaeis melanococca Gaertn., Fruct. Sem. Pl. 1: 18 (1788). Elaeis guineensis var. macrosperma Welw., Apont. : 584 (1859). Elaeis guineensis var. microsperma Welw., Apont. : 584 (1859). Elaeis dybowskii Hua, Bull. Mus. Hist. Nat. (Paris) 1: 315 (1895). Elaeis guineensis f. androgyna A.Chev., Vég. Ut. Afr. Trop. Franç. 7: 66 (1910). Elaeis guineensis var. ceredia A.Chev., Vég. Ut. Afr. Trop. Franç. 7: 66 (1910). Elaeis guineensis f. dioica A.Chev., Vég. Ut. Afr. Trop. Franç. 7: 66 (1910). Elaeis guineensis var. gracilinux A.Chev., Vég. Ut. Afr. Trop. Franç. 7: 66 (1910). Elaeis guineensis var. idolatrica A.Chev., Vég. Ut. Afr. Trop. Franç. 7: 66 (1910). Elaeis guineensis var. intermedia A.Chev., Vég. Ut. Afr. Trop. Franç. 7: 66 (1910). Elaeis guineensis var. macrocarpa A.Chev., Vég. Ut. Afr. Trop. Franç. 7: 66 (1910). Elaeis guineensis var. macrophylla A.Chev., Vég. Ut. Afr. Trop. Franç. 7: 66 (1910). Elaeis guineensis var. pisifera A.Chev., Vég. Ut. Afr. Trop. Franç. 7: 66 (1910). 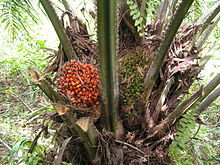 Elaeis guineensis f. ramosa A.Chev., Vég. Ut. Afr. Trop. Franç. 7: 66 (1910). Elaeis guineensis var. repanda A.Chev., Vég. Ut. Afr. Trop. Franç. 7: 66 (1910). Elaeis guineensis var. sempernigra A.Chev., Vég. Ut. Afr. Trop. Franç. 7: 66 (1910). Elaeis guineensis var. spectabilis A.Chev., Vég. Ut. Afr. Trop. Franç. 7: 66 (1910). Elaeis guineensis subsp. virescens A.Chev., Vég. Ut. Afr. Trop. Franç. 7: 60 (1910). Elaeis guineensis var. madagascariensis Jum. & H.Perrier, Mat. Gross: 6 (1911). Elaeis virescens (A.Chev.) Prain, Index Kew., Suppl. 4: 77 (1913). Elaeis guineensis var. albescens Becc., Contr. Conosc. Palma Olio: 62 (1914). Elaeis guineensis var. angulosa Becc., Contr. Conosc. Palma Olio: 49 (1914). Elaeis guineensis f. caryolitica Becc., Contr. Conosc. Palma Olio: 65 (1914). Elaeis guineensis var. compressa Becc., Contr. Conosc. Palma Olio: 71 (1914). Elaeis guineensis f. dura Becc., Contr. Conosc. Palma Olio: 37 (1914). Elaeis guineensis f. fatua Becc., Contr. Conosc. Palma Olio: 54 (1914). Elaeis guineensis var. leucocarpa Becc., Contr. Conosc. Palma Olio: 40 (1914). Elaeis guineensis var. macrocarya Becc., Contr. Conosc. Palma Olio: 71 (1914). Elaeis guineensis var. rostrata Becc., Contr. Conosc. Palma Olio: 50 (1914). Elaeis guineensis f. semidura Becc., Contr. Conosc. Palma Olio: 56 (1914). Elaeis guineensis f. tenera Becc., Contr. Conosc. Palma Olio: 38 (1914). Elaeis madagascariensis (Jum. & H.Perrier) Becc., Palme Madagascar: 55 (1914). Govaerts, R. et al. 2018. Elaeis guineensis in World Checklist of Selected Plant Families. The Board of Trustees of the Royal Botanic Gardens, Kew. Published on the internet. Accessed: 2018 Dec. 05.
International Plant Names Index. 2018. Elaeis guineensis. Published online. Accessed Dec. 05 2018. The Plant List 2013. Elaeis guineensis in The Plant List Version 1.1. Published on the internet. Accessed: 2018 Dec. 05. Tropicos.org 2018. Elaeis guineensis . Missouri Botanical Garden. Published on the internet. Accessed: 2018 Dec. 05. USDA, ARS, Germplasm Resources Information Network. Elaeis guineensis in the Germplasm Resources Information Network (GRIN), U.S. Department of Agriculture Agricultural Research Service. Accessed on 09-Oct-10.